Should You Pay Off Your Mortgage Early? This is an age-old question with no definitive answer. There are people who believe paying off mortgage as fast as possible is better, and there are people believe investing the difference is better. Dave Ramsey advocates paying off your home loan early in his book The Total Money Makeover. I believe this to be a great advice for his audience. In general, if you are uncomfortable with investing, you’re better off prepaying your home mortgage. However, investing instead of prepaying could be a more financially rewarding option for many people. Since the right answer depends on so many factors, I cannot say that mortgage prepayment or investing is better. Instead, let’s examine the key factors that will help you make the final decision for yourself. Interest payment savings — I believe this to be the most significant benefit of prepaying your mortgage. You’ll ended up saving a good amount of money on interest payments. The money saved is risk-free and guaranteed. Not to mention you’ll get out of a major debt obligation and own your home sooner. Investment risk — Since you can’t beat prepaying with risk-free investments like certificates of deposit, money market and savings, you’ll have to utilize investments that provide higher returns, such as investing in the stock market. With prepaying, there’s no investment risk involved. Investment gains are taxable — Your investments gains are taxed at your marginal tax rate for dividend and interest gains, and at the long-term capital gains tax rate. Therefore, you do not recognize the full value of your investment gains. For instance, if your investment gained $6,000 in value and you have to pay 18% on taxes (average), that’s only equivalent to $4,920 net gain. Opportunity cost — Depending on your interest rate, investing could provide you with superior return on your investment. So it’s possible to come out financially behind if you prepay. Lack of diversification — Your house could be a significant portion of your assets (it is for me). By prepaying, you are not increasing your real estate investment (it’s still the same, you are just lowering your debt). By opting to invest your money elsewhere instead of prepaying, you are increasing your investment in other asset classes, thus effectively reducing your real estate exposure and overall financial risk through diversification. Tax deductions — Your interest payment could be a significant portion of your tax deductions (it is for me). If you prepay, you are also reducing the amount you could use for tax deductions. For example, if you saved $5,000 on interest and your marginal tax rate is 25%, you’ll lose $1,250 in tax deduction — therefore, your net saving is only $3,750. Since long-term capital gains is only 15%, to match the $3,750 savings, you’ll need an investment gain of about $4,412, i.e., $3,750 / (1 – 0.15). However, this factor also depends on how much you itemize because the IRS offers standard deduction — as such, your true deduction is only the difference between your itemized deductions minus the standard deduction. Inflation — When you owe money and you pay back over the course of 30 years, inflation is your friend. Assuming an average 3.5% inflation rate, your $1,000 mortgage payment is only worth about $340 on the 30th year. If you prepay, you will lose this advantage, and it in fact, works against you. Liquidity — Your mortgage is a secured loan. Prepayment doesn’t earn you any favor with the bank. The bank still owns your house until you pay off that last penny. So if you hit some rough patches down the road and cannot make your payments, you could lose your home. By investing instead of prepaying, you maintain liquidity and give yourself a little insurance against potential financial hardship. Sure, you could sell your home to avoid foreclosure…but selling under pressure is not fun. 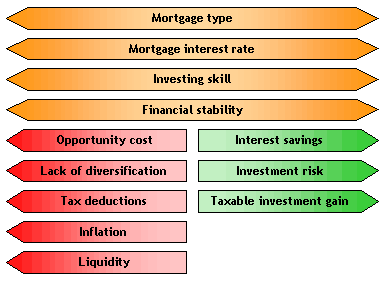 Mortgage type — There are many types of mortgage. That, and the prepayment clause, could play a major role in you prepaying versus investing decision. Mortgage maturity — The age of your mortgage determines how much interest savings you will realize. Prepaying a newer mortgage is more beneficial than prepaying a mortgage that only has a few years left. Mortgage Interest Rate — Obviously, it’s better to prepay (or refinance) a mortgage with high interest rate. Since the long-term return on investment for the stock market is about 8-10%, it’s most likely better to prepay if your mortgage interest rate is higher than about 6%. On the other hand, if your mortgage interest is lower, it’s probably better to invest. Investing skill — The premise of this argument depends on your investing skill. If you can’t, and unwilling to hire someone to help, the point is moot and you’re better of prepaying. Financial Stability — As mentioned earlier under liquidity, if your financial situation is unstable, it’s probably better to invest and stay liquid. This gives you some cushion against financial emergencies or losses. Is it better to pay a house off or not? To sum it up, there are many factors that affect your decision to prepay your mortgage or invest your money. In order to find the right answers, all of these factors must be considered carefully. Make small prepayments along with my normal mortgage payments. Essentially, I chose not to make any commitment to one specific area and spread my money out. The article was part of the M-Network series highlighting Dave Ramsey’s 7 Baby Steps for getting out of debt and getting your life on the right track financially. You can read about all of the steps over on Cash Money Life who kicked things off with a great introduction. As other members of the network add their articles, I’ll add them to the end of this post. Should You Pay Off Your Debt Before Investing? In my publication “Bubba’s Financial Planner”, regarding mortgages and early payoff, twice monthly payments and buying a home you can afford as well as trying to get a 15 or 20 year mortgage are all good ideas. However, I oppose making additional principal payments and suggest you invest that extra money in investments that will grow over time. First your money is growing. Secondly, bad things financially happen to good people, and you may need this nest egg for health reasons, or you may lose your job in a downturn. If, God forbid, such a disaster happens to your family, see if the banker will return any of those extra payments to you! Sure,as a second lien assuming you are still able to work! If you lose your house, you lose it all! Use those invested funds if and when you decide to pay off your house. You have control of your money during the entire period. Our bank considers our primary home a “2nd home” mainly cause my mail is sent to my former home which I had prior to my marriage in July. The condo which we are trying to refin is where my husband works so he is there 24/7. I’m there 3-4 days a week. Does this make sense? anything better we can do? @Linda – personally, I dislike BofA (poor service in my opinion). That said, I would approach this mathematically. Does the 2nd home status cause the interest rate to be higher? If yes, does it make sense for you to pay all the closing costs to secure a possibly lower interest rate? If not, does the 2nd home status affect you in any other way? It shouldn’t affect you tax-wise because loan type has no impact on how you actually use the home (talk to your CPA). Too many variables to consider. Will food double again in the next 2 years? Will cancer rates continue to rise? Will a new car cost $100k in 20 years? Go for the disposable income, don’t pay extra on the mortgage, live now and know your life expectancy based on your habits. Owning in my opinion is cheaper than renting. But i’d rather give my my money to a dirty banker now @ 4% than pay a dirty politician 40%, 20 years from now on a 401k. Work hard get nothing. We’re going down. It depends on what you are going to gain in controlling the money. For instance if you let the money sit in the bank at 4% intrest then no, it would be better to not pay 6.25 on the principal amount that money sitting in the bank is then costing you 2.25%. However if you invest the money in a venture that is gaining more than you are paying in intrest for a mortgage then it is very benificial to keep control of the money. In any case where you have your money is just a matter of assets and liabilities. PMI isn’t neccesarily a bad thing as the PMI payments are also now deductable as well. Rember there are only two ways to get equity in property out and have acces to the money. 1) Sell the property, 2) Pay someone to take it out Equity Line or Mortgage. @Maureen – I don’t think leaving something for your children should be a priority. You’ve worked hard to get this point and you should be thinking about yourself. I don’t think it should be about owning a house or having a bigger savings either — it should be about what is best for your finances. Unfortunately, there’s really not enough information here to go by. I think it’s worthwhile to consult someone that can really go over your finances. Does your school system offer any access to free (or discounted) financial advisor? I just retired at age 62 after teaching for 33 years. As a single mom I always struggled to make ends meet and always had to work two jobs. It wasn’t until the last few years of my career that I made enough money to actually be able to save a little money from each paycheck…not a lot but enough to say “Wow…I finally have a savings account!”. But, because my age was creeping up on me and I was tired, I retired and am now living on a pension. It’s a good pension but I have a mortgage payment that is eating it up. Here’s my dilemma: My mortgage allows me to have a tax deduction…without it I would probably have to pay the government on April 15th every year. But on the other hand, I would be able to hold on to most of my pension check each month and even continue to save a little each month. Finally, I would like to have something to leave my children when I’m gone….which is better, a house or a savings account? Any help you can offer is greatly appreciated. I always had to take care of my own finances…never had any help. Now I’m paying the price! Thanks. Good article and I like the fact you acknowledge the things you missed as people bring them up. My mortgages started in 1977, along with the car payment, the credit card bills and other debts. Looking back there are so many times where they all could have been paid off. Now approaching retirement even though it looks like there will be enough for my wife and I to retire comfortably we still have a mortgage. In the last 7 years my car payments went away, my toy payments disappeared and credit cards are paid each month with no interest charged. The freedom of mind not having those debts hanging over our head is tremendous. There have also been a number of young workers that have reported to me in the last 20 years. All of them made very good money. The biggest issues they have had in their families have been debt. Unfortunately often leading to a divorce. Although there were always other issues as well in more then 70% of the cases debt and more money were an issue. I even suspect in many of the ‘Other reasons for divorce’ that the prospects of a better financial life played a big part. I know in my own personal divorce several years ago finances was also a big issue even though we were better off debt wise then a lot of others around us. Due to the ‘freedom of the mind’ and not having a large committment over our heads we are considering paying off the mortgage way early. We LOVE not having to worry about a car payment, how much to pay on the credit cards this month or ‘gosh that stupid camper, boat, motorcycle…’ just sits there for 6 months and we are making payments on it!!! Right now it makes all the sense in the world to make house payments at 4.25% especially considering there are 2 fully vested retirement accounts, two 401K plans and our investmenst have paid back over 50% in the last 7 years. Currently most of our money pays dividends at the rate of 6% avg. and investments are doing fairly solid 4-8% growth. But what is ‘Peace of Mind’ really worth. I will post later on whether we decided to pay our mortgage off and why. Still trying to justify it one way or another. Thanks for the great article and all the great comments. For those of you deciding whether or not to pay off your mortgage early. I just spent a long time reading through these post. It speaks volumes that for those that did pay off their homes early, not one them regreted it. That should tell us something. For example, scroll up an read the post by “Bill” on March 9, 2011…. He sounds pretty set for the rest of his life. No NO NO! You can refinance your home on a 10,15, or 20 (20 not recommended) at a pretax rate of about 3.5-3.6% fixed for the life of the loan. Avoid adjustable rate notes like the flu. Instead invest the money in 2 or 3 quality blue chip dividend paying stocks ie AT&T (T) 5.8% dividend, Kinder Morgan Partner 5.5% dividend (KMP) and Bristol Meyers (BMY) 3.8% dividend yield. We have a Fed chairman that is printed money like newspapers and inflation is setting in. Short term interest Rates have started to rise and longer term rates will follow. The large cap quality stocks that pay you a good dividend to own them will more than pay the interest on your note @ 3.5%. Never get anything longer than a 15 year mortgage as the first 15 years are pretty much interest with minimal principal. The last 15 years are when you start amortizing the principal (amount of note). Run the numbers of how much more interest you pay on a 30 tear note as opposed to a 15 or 20 year. It will amaze you and help you save tens of thousands of dollars. A quality blue chip stock raises its dividend and the market is deeply oversold as measured by divided yields and P/E ratios. You will be paid dividends in excess of the amount of the mortgage interest. In addition quality stocks will average you a 8-10% annual return including dividends. The dividends are taxed as ordinary income but the inter you pay on your mortgage can offset this dollar for dollar if you itemize. Last thing if you are starting a family NEVER get a note over 15 years as this will result in your OWNING your home OUTRIGHT before the kids got to college. This note is prepared only for the use of honest, hard working Americans as you are the pillars of the greatest country in the world.